Hey Bartender – I'll have a Raintree Tea Martini! We’re excited to introduce our newest tea with a twist: the Raintree Tea Martini made with ALTAR – a sophisticated, all-natural, alcohol-free beverage, also known as an Herbal Martini. It is curated to be enjoyed alone, or paired with fine spirits as a premium herbal cocktail mixer. 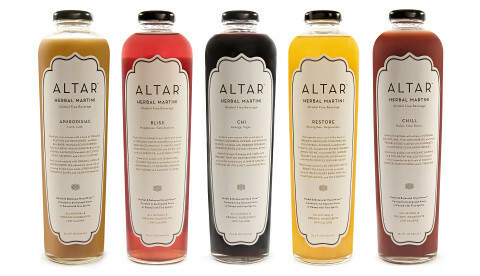 Each ALTAR recipe is curated with 13-24 unique ingredients ranging from single estate teas, organic fruits and vegetables, spices, herbs and botanicals. Curated in Portland, Oregon, each blend provides a truly extraordinary mood-enhancing experience, with only 30 calories per 3oz. Aphrodisiac, Bliss, Chi, Restore, Chill. $21.95 each/25oz. Pop in, sip a sample and pick one up to enjoy this weekend!